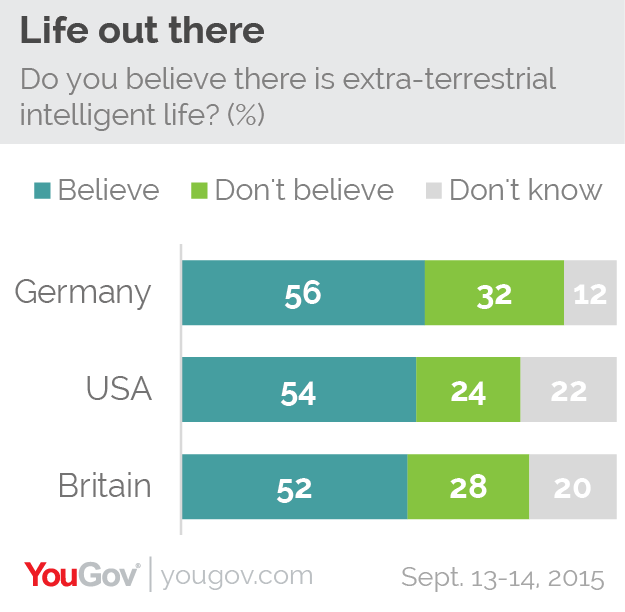 September 24, 2015, 9:35 a.m.
More than one in two people in the UK, Germany and the US believe there is intelligent life out there in the universe. The next time the subject comes up at the dinner table and you hear sniggers when someone admits they believe in aliens, it is worth remembering that it is not a fringe belief to think there is intelligent life out there – it is the mainstream viewpoint across the western world. Men, across all three countries, are more likely to believe in extra-terrestrial life. Only in Germany do a majority of women (51%) believe. 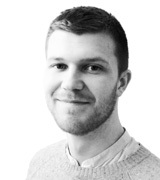 The oldest people are the least likely to believe in all three countries – in Britain, for example, 45% of over-60s believe in aliens compared to 59% of 18-24s. Our total lack of evidence for intelligent life contradicts the incredibly low chance that ours is the only planet where it exists in the 1,000,000,000,000,000,000,000,000 planet universe, a problem knows as the &apos;Fermi Paradox&apos;. 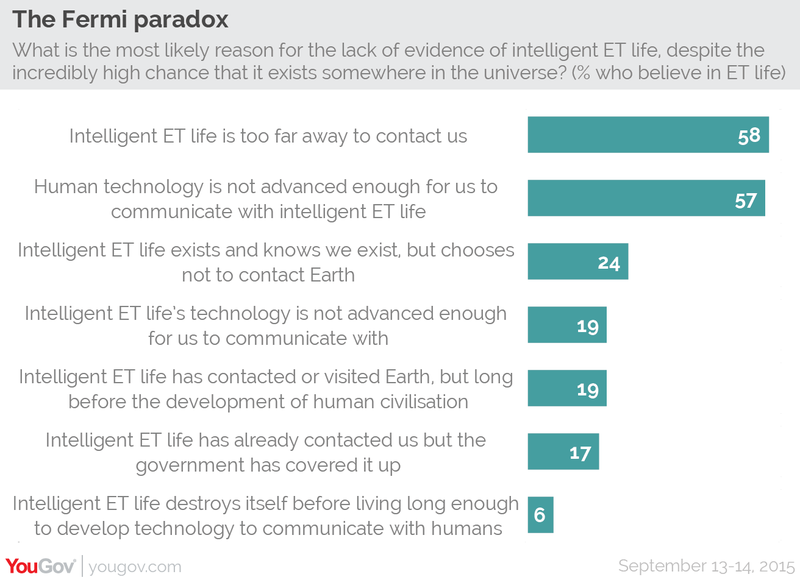 British people who believe alien life exists say the most likely reasons for the paradox are that intelligent life is too far away for us to be able to contact it, and that our technology is not advanced enough for communication. One conspiratorial possibility is that we have contacted intelligent life but the government has covered it up. Few (17%) say this is a likely reason. The question still remains of whether it&apos;s a good idea to even try to contact alien life – Hollywood at least would suggest it probably is not. British people tend to say we should send a digital message describing life on earth to other civilisations, however, (46% say we should, 33% say we should not) and again men (54%) are much more keen on the idea than women (40%).